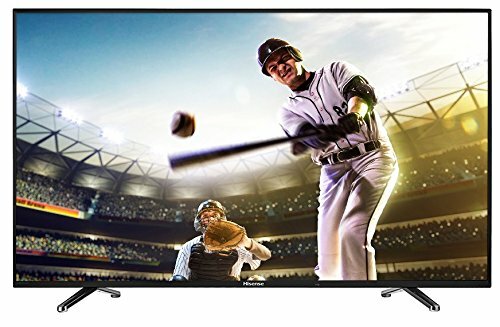 This 50-incher is a 1080p 60Hz Smart LED TV that offers some great features for a pretty great price. Even though the Hisense 50H6B might not be a major player in the home entertainment area, you shouldn’t let that put you off because there really are many great things that make this TV a strong competitor to even many much more expensive brands. This Smart TV makes streaming TV shows and movies through Netflix super quick and super easy. Also, its 1080p picture resolution provides cinematic, amazing viewing experience through vivid and detailed images, easy-to-navigate screen and crisp sound. The 50-inch screen is an ideal size for your living room, media room, larger bedroom, or just about any nice-sized room in your home. With a good array of features and specifications, it is pretty hard not to be impressed with this TV, and we are about to explain what this amazing release from Hisense truly offers to its consumers. This TV has pretty generic yet quite stylish design with an ultra thin bezel as well as moderately thin profile that offers all the major options for inputs and outputs. You have the choice of attaching the TV on the two pronged legs that click into place, or wall mounting it like a piece of art. The dimensions of this TV with the stand are 44.3 x 27.6 x 9.7 inches, and without the stand 44.3 x 25.6 x 3.2 inches. The connectivity options on the Hisense 50H6B include 3 HDMI ports, 2 USB ports, 1 Digital Audio Output, LAN port for Ethernet, 1 RF input, RCA Composite Video input 1, 1 Earphone Audio Output, 1 RCA Component Video input, and 1 right/left Audio input for Composite. The screen size is 49.5 inches measured diagonally from corner to corner which is a great size for living room, family room, media room, or larger bedroom. Being a budget Smart TV, one would expect that the TV lacks in the picture quality and performance. But, this model actually doesn’t. It is quite surprising how sharp the picture is, and how great black and white levels, as well as detail and color reproduction are shown on this TV. The 1080p resolution screen means you won’t miss any detail when watching your favorite programs and movies in crystal-clear, true-to-life colors. There is no doubt that anyone would enjoy the Full HD resolution that 50H6B projects from 1080 pixels in height and 1920 pixels in width. It is also pretty impressive what the SMR (Ultra Smooth Motion Rate) feature provides. It allows you to take in all the important details when watching fast-moving movie scenes, sports competitions, or games. This technology helps to minimize blur and judder that can be quite distracting. With this TV, you have the possibility of adjusting the sound and picture modes to suit your preference. The Hisense 50H6B hosts Total Technology from dbx-tv that brings amazing audio to the embedded speakers with Total Volume, Total Sonics, and Total Surround. These are the features that improve the sound, volume, and bass. You won’t have to attach a soundbar or some other external audio device to this TV, because the sound is already maximized. The clear detail and high frequency from the two 10-watt speakers are more than enough to provide an amazing experience while watching your favorite movies. This TV also has numerous built-in apps, so just browse through Vudu, Padnora, Netflix, and many more (19 of them) to enjoy. All this at a very affordable price sound really amazing.